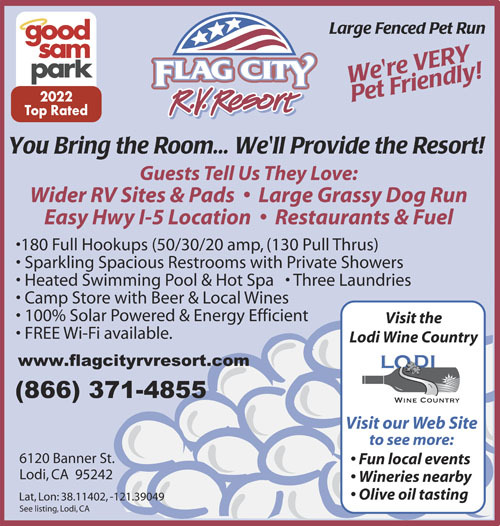 Our large modern RV resort in Central California Wine Country has easy on/off freeway access and a great fenced pet run featuring wide pull-thru big rig sites, free wifi, a pool & spa, and our store offers local wines. Called in advance for spot, out of the ordinary that they did not ask for a CC, so were leery if spot would be available after hours. But there it was as promised. Narrow site, had to walk in the dirt to get around unit. Nice patio and table, though too hot to enjoy. Bit of shade on the trailer. Though three blocks from freeway no road noise. Hard to find following GS directory's directions. I would call to ask how to get there. We stop here overnight a few times a year. In the past the only thing we didn't like was the wifi. They've upgraded it and it works great now! The staff is friendly and helpful. The restrooms and other facilities are clean and very nice. We made a reservation for a one night stay on our trip home. I called early in the AM to secure a spot since we have a very large 5th wheel and some parks can not accommodate our size. We arrived shortly after the office closed at 4:30pm and found our site information on the door as promised. However, when we pulled to our spot, we found that the space was taken. I attempted to call the office and was given a general mail box number. There was no emergency number listed on any of the handouts, but it stated there was a number to call on the office door - which was the general office number. There is no one to contact should you encounter a problem when the office is closed. After roaming around the park and the hour getting later and later, a maintenance man approached. He could not explain why our spot was taken and helped us into a spot for the night. My concern is that if we had taken the time to gas up that night rather than the following morning, there would have been no where for us to stay. The office stated "this is not a 24 hour business", so if you have difficulty the handouts state you should dial 911. Of all the hundreds of Good Sam parks we have stayed at, this was the ONLY ONE that has not honored a reservation or at least had an employee on site to assist campers with their concerns. Never, ever again! Don't count on a reservation if you stay here. Or if you do, get there before the office staff goes home because you are on your own! We were only there overnight as we headed to and from SoCal to Oregon. Park was clean and well kept. There was easy access to highway 5. The staff was friendly and helpful. The only problem we had was the location of the utility hook-ups. We tow a car behind our motorhome. The hook-ups were located near the entrance to the pull-through, so they were way back next to the back of our car. It would have been nice if the utilities were located closer to the middle of the space so that they would have been closer to where we needed them. I spend almost two weeks here. The front office was friendly and offered good suggestions on things to do. My site was next to a nice shady tree, the cable worked well. The pool and spa were refreshing. Laundry & showers were spacious and very clean. There are almost 100 wineries nearby to check out. There are good restaurants and grocery stores within 5 miles. The only thing that was sub-par was the wifi. It only seemed to work for about an hour in the early mornings. I'd stay here again. We stay at this park quite often as an overnight parking place. The staff is great. They really go out of their way to make your stay perfect. All the facilities are kept clean and in great shape. The only issue at all is that since I switched from a Windows based laptop to a MacBook Pro I haven't been able to access the wifi. Dog run was under construction during our visit but it didn't discourage our dogs. Easy on and off I-5. Check in was a breeze (had reservations). Nicely paved and plenty of room to navigate a big rig. Hook-ups in good shape. Didn't use park wifi or cable. Good satellite signal. Pull through was barely long enough for 42' and tow. Front of park were mostly brief stayers. Back of park appeared to be long term guys working in the area. The entire park was orderly, clean and quiet but for some expected traffic noise. Not a destination park but a great place to stop for a day or two on the way through and enjoy the wonderful wineries and Zinfandels. Very pleased with this park. Manager very friendly as well as office people. Cement site with patio space. Facilities very nice and clean. Laundry room very reasonably priced. Close to Lodi for shopping supplies. Stayed one night. Came in after hours and spot designated has someone in it. There were other spots available so we took one of those, not a big deal this time. Could not get WiFi to work at site. Restrooms are clean and the sites are concrete pads. Fine for a one night stay. The facility is very nice. The pool is great and the restrooms are super clean. The laundry closes at 9 pm, which is very inconvenient. The worst part of staying here is the ridiculous Wi-Fi. It doesn't work. And their explanation for why it doesn't work defies intelligence. They say it is because rv's are made of aluminum and Wi-Fi can't penetrate it. Stupid, right? You have to drive to their office and sit in their lobby to use their Wi-Fi. There should not be wi-fi listed as a benefit in the Good Sam guide for this rv park. It isn't true. Use your passport America card and you will get 2 nights at half price. Park is slowly deteriorating. WiFi is one of the worst I have experienced. There has been no investment in improving this park. The grass in gone and you have dirt and weeds. They could have installed gravel. Good place to stay short term, i.e., passing through but not to stay for any length of time. We travel from our California home to our Oregon home and truly enjoy the quiet pristine atmosphere at this RV camp. The bathrooms are clean, safe and accessible. We will always use this RV camp! One of my most favorite resorts that I stay in when in route to Oregon from SoCal. My pull through site was great and my wife and I love the hot water jacuzzi. Been here three times so far and hopefully many more times going forward. Spaces are very narrow and small. They do have concrete pads, although only wide enough for the 5th wheel without slide outs. Once the slides are out you have to walk on dirt and stickers to get from your door to your vehicle, which has to park partially in the dirt area as well due to the short spaces. There are daily spaces that are wider and more expensive, but they will not let you stay there if you will be longer than 5 nights, at least that is what they told us when we inquired while staying there. The restrooms and laundry facilities are nice. The dog walk area is full of stickers so I suggest avoiding it unless you enjoy pulling these things out of your pet's feet. Overall rating out of 10 would be a 7. 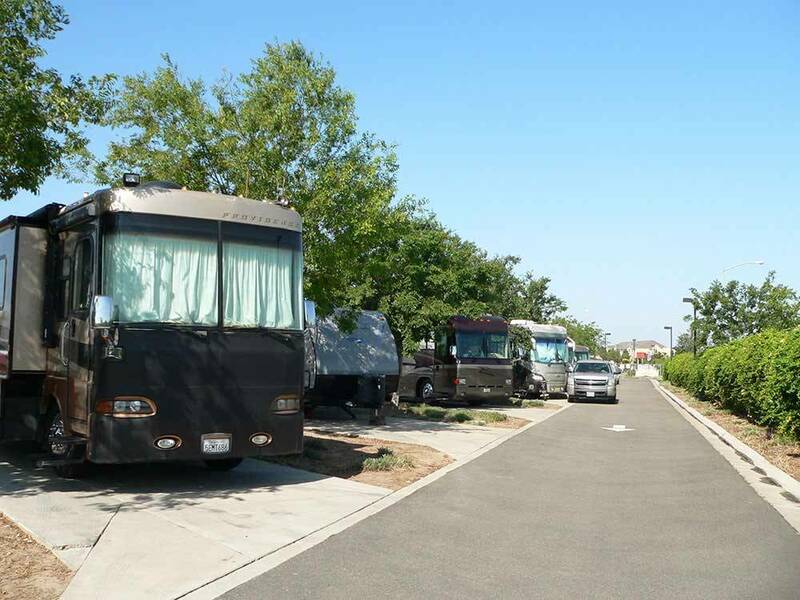 Our central valley RV resort is surrounded by reasons to stay longer! Wine tasting, Delta river cruises, historic Sacramento museums, and brewery tours are all close by. Plus lakes & rivers, golf courses and many restaurants.